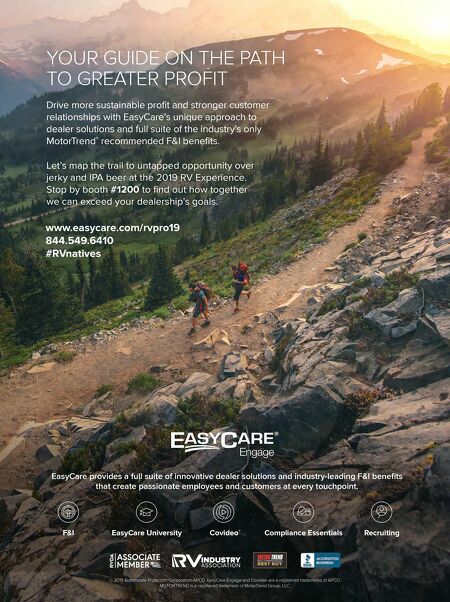 116 • RV PRO • March 2019 rv-pro.com Distributor Show Coverage A F T E R M A R K E T PullRite Super 5th Single-Point Fifth Wheel Hitch Paul Percival is a regional territory manager for PullRite, but more than that he is an avid RVer who tows a fifth wheel and was a faithful PullRite customer for far longer than the four years he has worked for the company. So, when the Mishawaka, Ind.-based maker of towing prod- ucts introduced its new line of Super 5th Single-Point Hitches that combine the lightweight design of the SuperLite brand with the innovative underbed gooseneck mounting system and the reliability of the company's exclusive automatic latching and locking hitch plate, he says he immediately saw the value of the product and the value it brings to customers. Notably, the single-point hitch series offers a relatively easy, one-person installation process, according to Percival. He notes that the uninstallation method is equally easy, for those occasions when RVers want to make use of their pickup bed. "Hooking and un-hooking with the Super 5th Single-Point hitch is quick, easy and uncomplicated," adds Scott Later, Pull- Rite national sales manager. "There's no getting in and out of your truck multiple times during hook-up. There's no getting dirty leaning over a high bed side to reach safety pins and locking mechanisms that are required on all other fifth wheel hitches, to ensure you don't drop your trailer." The ease of installation/ uninstallation is made possible in part thanks to the light- weight design and dual-articulating hitch plate, which is easily removable with two pins and clips, according to Later. The sin- gle-point hitch series features the only self- latching/ locking hitch plate on the market, he adds. Later says the hitch's rotary jaw cradles the inset portion of the trailers king pin, distributing wear evenly and providing a smoother ride. This design has been a Pull- Rite standard for decades and represents the tightest, safest, most con- venient, king pin connection available, he says. The single-point hitch mounts directly to any OE or aftermarket 2-5/16-inch gooseneck ball. The flexible design and offset allow for the king pin to be positioned rear of the axle allowing for tighter turning radius regardless of the tow vehicle, according to Percival. Another exclusive to the Super 5th Sin- gle-Point Hitch is that the bed saver rails, which help prevent damage to the truck bed because they are not attached to the hitch, Later says, adding that other single-point hitches can cause bed damage during stops and starts as a result of the rails being welded to the hitch base and digging into the truck bed. The Bed Saver Rails act independently to insulate the truck bed from hitch movement, he explains. "We coat the underside of the bed saver with a non-slide, bed liner material to ensure maximum protection to both the bed and the hitch," Later says. Later emphasizes the quality PullRite engineers and builds into this new hitch, and that its precision tolerances are achieved by laser-cut, U.S.A.-made, superior-grade steel parts that are manufactured in northern Indiana. Initially, the Super 5th Single-Point Hitch will be introduced with an SAE J2638 weight rating of 24,000 pounds, with other weight ratings to follow. The MSRP is $789. Dealers can look for the hitch to become available late in the first quarter of this year. What impressed RV PRO: The ease of installation/ uninstal- lation – thanks to the product's unerbed gooseneck mounting system and automatic latching and locking hitch plate – makes this light weight fiver hitch a standout product. 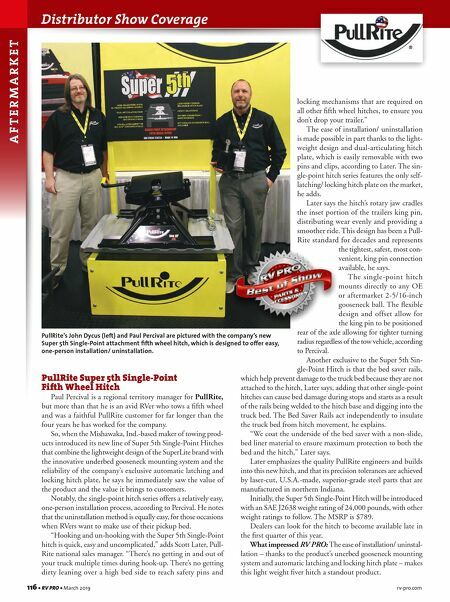 PullRite's John Dycus (left) and Paul Percival are pictured with the company's new Super 5th Single-Point attachment fifth wheel hitch, which is designed to offer easy, one-person installation/ uninstallation.